A Treasury of Songs from Stage & Film, Specially Designed for Young Singers! 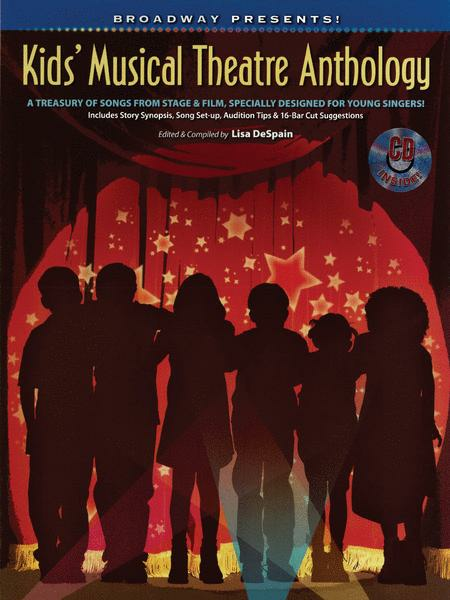 A delightful collection of musical theatre songs that kids love to perform, from a variety of shows. Using original scores, the songs have been selected and adapted with the ranges and skills of young singers in mind. Included in this collection are short summaries for each of the musicals, a dramatic and character set-up for each song, audition tips, and 16-bar cut suggestions. Songs include: All I Do is Dream of You (from Singin' in the Rain) • Alone in the Universe (Seussical: The Musical) • Be Kind to Your Parents (Fanny) • Big Blue World (Finding Nemo: The Musical) • Consider Yourself (Oliver) • Different (Honk!) • Doll on a Music Box/Truly Scrumptious (Chitty Chitty Bang Bang) • The Girl I Mean to Be (The Secret Garden) • Good Morning (Singin' in the Rain) • Green Eggs and Ham (Seussical: The Musical) • Heart (Damn Yankees) • I Gotta Crow (Peter Pan) • I Just Can't Wait to Be King (The Lion King) • I Want It Now (Willy Wonka and the Chocolate Factory) • It's Possible (Seussical: The Musical) • Johnny One Note (Babes in Arms) • Part of Your World (The Little Mermaid) • Pure Imagination (Willy Wonka and the Chocolate Factory) • Shy (Once Upon a Mattress) • Supercalifragilisticexpialidocious (Mary Poppins: The New Musical) • When I Get My Name in Lights (The Boy From Oz) • Wouldn't It Be Loverly (My Fair Lady). CD includes accompaniment tracks. This is one of several musical theatre collections I use for my private voice studio. I particularly LOVE that it includes the story synopsis, song setup, and 16-bar cut for auditions. Thank you, Lisa DeSpain for putting it together! This was a poor pick for me because I wanted familiar songs. Although many popular musicals were listed, the songs were not ones that are generally known to the public. November 08, 2009 Excellent resource! music. I highly recommend this book! 47 of 90 people found this review helpful. This anthology presents songs that are not overdone and appeal to young singers. The CD tracks are the best I've worked with. My students are enjoying working on these selections.